Building an empire isn’t a quiet process. It isn’t easy. It isn’t without attention, or stress, or work, or struggle. However, in the end, it’s pretty awesome. 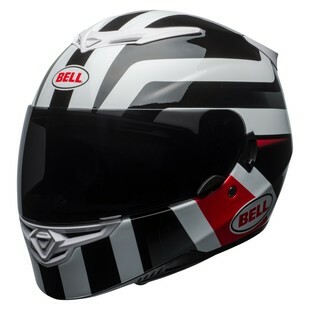 The Bell RS-2 Empire Helmet is a graphical update to the RS-2 lid that reflects all of that. High-contrast and not at all quiet in its design, the RS2 Empire stands out in any crowd. But the graphic isn’t all that this helmet has going on for it, as the lid also features a plethora of notable features such as a lightweight fiberglass shell, drop down inner sun-visor, and X-Static XT2 Silver liner (among many others). If you are a rider who isn’t looking to fade into the background, who enjoys showing up loud and clear, then the RS-2 Empire Helmet will be well worth your time.